The charges were upgraded at a hearing on Thursday. The father of a 4-year-old Miami boy who was found mauled to death in a dog attack has now been charged with manslaughter. Charges for Javon Dade Sr., 30, were upgraded from child neglect causing great bodily harm to manslaughter at his arraignment Thursday. His girlfriend, 26-year-old Alessandra Carrasco, who was also arrested on child neglect charges, is also being charged with manslaughter. It is unclear if either has an attorney. The body of Javon Dade Jr. was found in overgrown grass in the family's back yard after he was reported missing on Aug 13. He had been mauled to death by a dog or dogs in the yard, police said. According to Miami-Dade Police arrest reports, Dade Jr. was found with "severe head trauma and neck trauma consistent with a dog mauling." 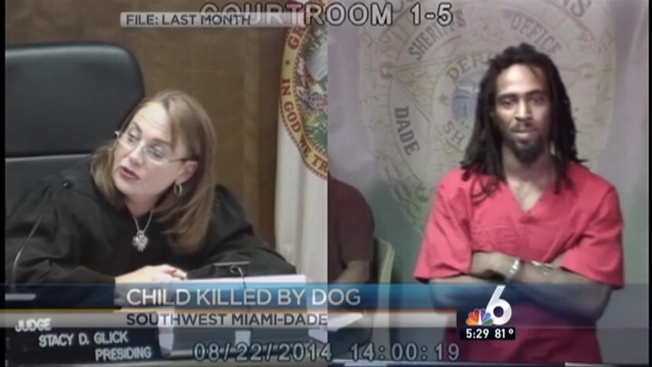 In court, prosecutors said Carrasco "brought the dog into the property" and that she "was in charge of the child." Carrasco and Dade Sr. had spent the night and early morning smoking marijuana cigarettes laced with cocaine, the reports said. When Dade Sr. went to check on his son around 9:20 a.m., he wasn't in his bedroom, the report said. Police arrived and found the body in the yard. Police said Animal Services workers took six dogs from the scene and one, a blue and white adult pit bull, was later euthanized. The Department of Children and Families had warned of the dogs three years before the incident, officials said.